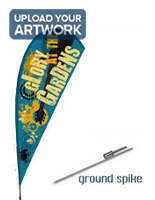 These 3-color teardrop flags are one-sided, and the reverse image can be seen on the other side, due to the silkscreen process allowing ink to penetrate the fabric. 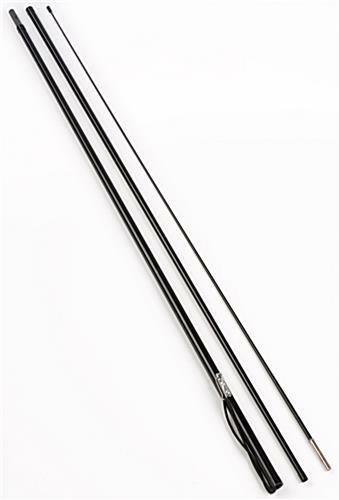 A metal ground stake makes signage easy to place in soft dirt or green grass. 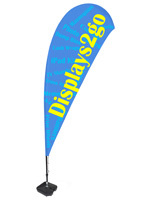 This polyester sign is 11' tall, with an eye-catching blue design and yellow lettering that can be seen from a distance. 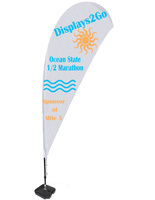 That's great for big venues like concerts, fairs, festivals, auto shows, or to capture roadside attention from passers by. 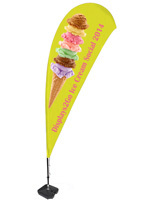 These 3-color teardrop flags for retail and business boost brand recognition and sales. 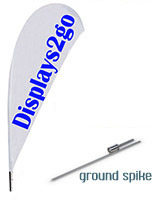 These outdoor banner stands feature a collapsible design for effortless setup. 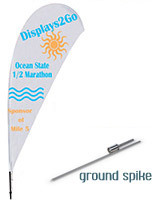 These teardrop flags with spear base and full bleed graphics are affordable marketing tools that make a big impression. Carry bags are included in shipment to keep compatible pieces together when units are knocked down for storage. 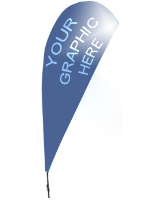 To order replacement graphics, please call 1-800-572-2194 or 1-401-247-0333.